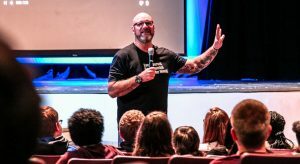 In episode 47 of The BOOM Podcast, Amazon bestselling author and mental health speaker Jeff Yalden spoke from the heart about his struggles with mental illness as well as his views on the state of mental health in the United States. 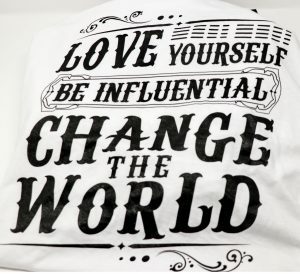 I hope I can teach you about Mental Illness! The one key fact Yalden wants those struggling with mental health issues to understand is this: Living with mental illness does not mean that you are crazy. He thinks this great, because sometimes when we take our medication, we start to feel good and we can potentially fool ourselves into believing that we no longer need it. “I’ll tell you what: I’ll be on medication forever,” he said. Over the years, Yalden has met many struggling people who say that they don’t need medication or therapy because that stuff is for “sick” people. We must stop stigmatizing mental illness and see it for what it is: A medical condition that can be treated and managed, like an allergy or diabetes. 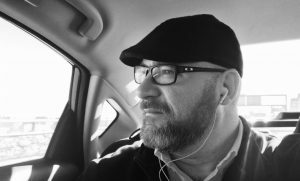 Yalden is a man who lives with mental illness every day and is deeply passionate about mental health. “My friends, it has really affected my life. And I think it affected my life when I was much less aware of what I was going through,” he said. 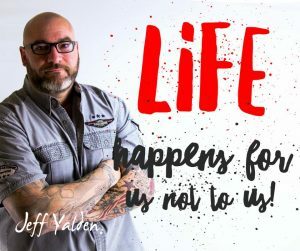 After going through a divorce, Yalden took a hard look at himself in the mirror and asked himself honestly what he had to do with the failure of the marriage. He continues to look in the mirror daily – not focusing on how he looks, but rather on who he is. According to Yalden, mental illness is going to be the greatest public health crisis of our time. Yalden realizes that many of us are not suffering from mental health issues. We all get bummed out occasionally or have days when we’re feeling down. 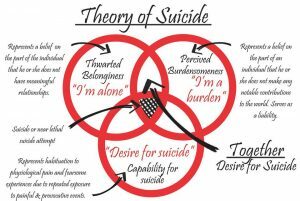 But then there are issues like major depression and dysthymia – a persistent and chronic form of depression that some folks don’t even realize they have. If your loved one is willing to get the help they need, get in their corner. When a person can admit that they live with mental illness, the prospect of reaching out for help becomes much less daunting. And Yalden knows how daunting mental illness can be. He said that for those who live with mental illness, smiling is hard – but when you see someone smiling, just smile too. And remember: Self-care is not selfish. “If you live with mental illness and you are seeing a therapist, it’s like being healthy and going to the gym every day. That is self-care – and if you are going to continue to stigmatize the people who live with mental illness – you are part of the problem. 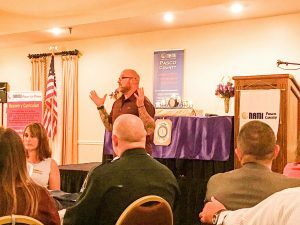 On Thursday, October 5, mental health speaker and Amazon bestselling author Jeff Yalden spoke at the Pasco County, Florida chapter of NAMI – the National Alliance on Mental Illness. Yalden believes that mental illness is quickly becoming the greatest public health crisis of our time. He said the bottom line is that mental health isn’t necessarily just a family issue anymore. It is an economic issue and we are all responsible. 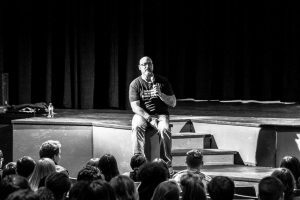 “It’s really up to all of us to start getting comfortable being uncomfortable talking about mental health,” he said. Yalden said he had an awesome time, and that he was honored to have had the opportunity to share his heart with them. 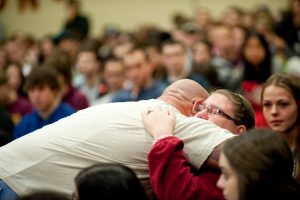 He spoke to people that, like him, are living with mental illness. He also spoke to community influencers, police officers, hospital workers and folks who work in the mental health field – validating the importance of what they do every day. Before every speaking event, Yalden makes it a point to gather his thoughts, to pray and to center himself so that he can be present and with his audience. Earlier, he contemplated running out and buying some nice clothes for the event, but if he did, he thought that would change who he is. Yalden speaks in casual clothing. That’s who he is. 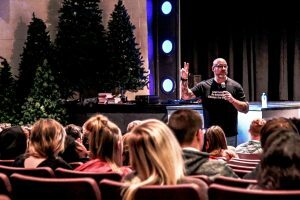 In his presentation, Yalden laid it all out – including the time when his marriage of 17 years ended in divorce and he found himself in front of the mirror. Then and there, he asked himself what he had to do with the split. That question in that moment made a profound impact on him. “That was the most powerful place I think I have ever been in my life. I realized at that moment when I looked in the mirror that my mental illness was greater than I ever expected it to be,” he said. 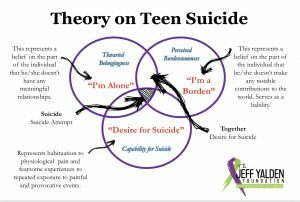 Yalden is diagnosed with major depression, bipolar II disorder and PTSD. 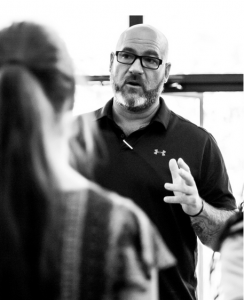 His goal in living with mental illness is to be transparent and to live with authenticity and to work on himself every day and live in a way that shows mental illness, when treated – like chemotherapy for cancer – can result in a healthy life. Life happens for us – not to us. He went on to talk about anger – and the cognitive distortions associated with it. “I think everybody in this room has somewhat of a problem with anger,” he said. When trying to understand where someone else is coming from. Yalden said that he has come to learn that the more you are willing to just be present and listen, the more the other person is willing to share. He talked about God and mental health – by all accounts a tough subject to tackle. 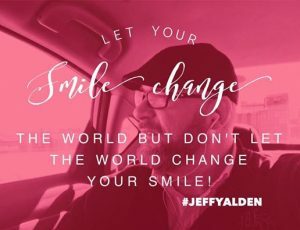 Yalden always wants to make sure that his audiences receive the full intent of the messages he wishes to convey, and that he is putting it out there as clearly as possible. Yalden closed with four simple letters: T-I-M-E.
“Let’s continue to do our job every day,” he said. NAMI member Richard Michaels said that Yalden’s talk was very informative. “He really has an interesting life story, and you will really learn a lot from him when you listen to him. And listen to the little things that he talks about – the little things that we take for granted, but mean so much in our lives,” he said. Yalden couldn’t be happier about the event, which was well-attended. For more information about Jeff, click HERE. Jeff’s speaking calendar fills up fast. To book him now for your event, organization or school, call 800-948-9289.